Buparlisib (BKM120, NVP-BKM120) is a selective PI3K inhibitor of p110α/β/δ/γ with IC50 of 52 nM/166 nM/116 nM/262 nM in cell-free assays, respectively. Reduced potency against VPS34, mTOR, DNAPK, with little activity to PI4Kβ. Phase 2. Clin Cancer Res, 2016, 22(3):644-56. NLGN3 mRNA expression in SU-pcGBM2 cells after 12 hr exposure to vehicle, 50 nM NLGN3, 100 nM BKM120, or 50 nM NLGN3 + 100 nM BKM120. Cell, 2017, 161(4):803-16. Buparlisib (BKM120, NVP-BKM120) purchased from Selleck. Western blot analysis of cleaved caspase 3 in T cell-enriched PBMCs. J Hematol Oncol, 2016, 9(1):113. Buparlisib (BKM120, NVP-BKM120) purchased from Selleck. AN3CA (A) and JHUEM2 (B) cells were treated for the indicated times with DMSO, 0.3 μM BGJ398 (BGJ), 0.3 μM GDC-0941 (GDC), 0.6 μM BYL719 (BYL) and 0.6 μM BKM120 (BKM) alone or in combination. Cell lysates were immunoblotted with antibodies for phospho-AKT (Ser473), total AKT, phospho-ERK (Thr202/Tyr204), ERK2, phospho-S6 (Ser240/244), total S6, phospho-4EBP1 (Thr37/46), total 4EBP1, total PARP and cleaved PARP. Tubulin was detected as the loading control. Western blot analysis of AN3CA and JHUEM2. Mol Cancer Ther, 2017, 16(4):637-648. Buparlisib (BKM120, NVP-BKM120) purchased from Selleck. After starved in serum-free medium for 24 h,A549 cells incubated with the indicated concentrations of BKM120 for 3 h,followed by 20-minute stimolation of 100ng/ml EGF. Dr. Zhang of Tianjin Medical University. Buparlisib (BKM120, NVP-BKM120) purchased from Selleck. One customer. Buparlisib (BKM120, NVP-BKM120) purchased from Selleck. Dr. Pilar Eroles of INCLIVA Biomedical Research Institute.. Buparlisib (BKM120, NVP-BKM120) purchased from Selleck. BKM120 is dissolved in DMSO and directly distributed into a black 384-well plate at 1.25 µL per well. To start the reaction, 25 µL of 10 nM PI3 kinase and 5 µg/mL 1-α-phosphatidylinositol (PI) in assay buffer (10 mM Tris pH 7.5, 5 mM MgCl2, 20 mM NaCl, 1 mM DTT and 0.05% CHAPS) are added into each well followed by 25 µL of 2 µM ATP in assay buffer. The reaction is performed until approx 50% of the ATP is depleted and then stopped by the addition of 25 µL of KinaseGlo solution. The stopped reaction is incubated for 5 minutes and the remaining ATP is then detected via luminescence. Method: A2780 cells are cultured in DMEM supplemented with 10% FBS, L-glutamine, sodium pyruvate, and antibiotics. Cells are plated in the same medium at a density of 103 cells per well, 100 μL per well into black-walled-clear-bottom plates and incubated for 3-5 hours. BKM120 supplied in DMSO (20 mM) is diluted. The diluted BKM120 solution (2 μL), is then added to cell medium (500 μL) cell medium (concentration from 0-6.6 μM). Equal volumes of this solution (100 μL) are added to the cells in 96 well plates and incubated at 37 °C for 3 days and developed using Cell Titer Glo. Inhibition of cell proliferation is determined by luminescence read using Trilux. Animal Models: U87MG and A2780 xenografts are established in female nu/nu mice. Administration: Dosed orally daily (q.d.). Burger MT, et al. ACS Med Chem Lett, 2011, 2 (10), 774–779. Zheng Y, et al. J Mol Med (Berl), 2011 Dec 30. Park E, et al. Int J Oncol, 2012, 40(4), 1259-1266. Koul D, et al. Clin Cancer Res, 2012, 18(1), 184-195. CAL-101 (Idelalisib, GS-1101) : p110δ-selective, IC50=2.5 nM. TGX-221 : p110β-specific, IC50=5 nM. BEZ235 (NVP-BEZ235, Dactolisib) : p110α/γ/δ/β, IC50=4 nM/5 nM/7 nM/75 nM. CAL-101 (Idelalisib, GS-1101) : Approved by FDA for Relapsed Chronic Lymphocytic Leukemia, Follicular Lymphoma and Small Lymphocytic Lymphoma. 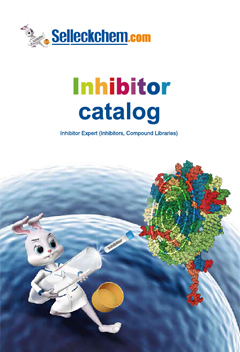 VS-5584 (SB2343) New : Potent and selective dual PI3K/mTOR inhibitor for mTOR, PI3Kα/β/δ/γ with IC50 of 3.4 nM and 2.6-21 nM, respectively. Taselisib (GDC 0032) is a potent, next-generation β isoform-sparing PI3K inhibitor targeting PI3Kα/δ/γ with Ki of 0.29 nM/0.12 nM/0.97nM, >10 fold selective over PI3Kβ. Features:A beta isoform-sparing PI3K inhibitor. Pilaralisib (XL147) is a selective and reversible class I PI3K inhibitor for PI3Kα/δ/γ with IC50 of 39 nM/36 nM/23 nM in cell-free assays, less potent to PI3Kβ. Phase 1/2. GNE-317 is a potent, brain-penetrant PI3K inhibitor. LY294002 is the first synthetic molecule known to inhibit PI3Kα/δ/β with IC50 of 0.5 μM/0.57 μM/0.97 μM, respectively; more stable in solution than Wortmannin, and also blocks autophagosome formation. 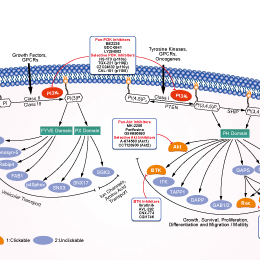 It not only binds to class I PI3Ks and other PI3K-related kinases, but also to novel targets seemingly unrelated to the PI3K family. 3-Methyladenine (3-MA) is a selective PI3K inhibitor for Vps34 and PI3Kγ with IC50 of 25 μM and 60 μM in HeLa cells; blocks class I PI3K consistently, whereas suppression of class III PI3K is transient, and also blocks autophagosome formation. Solutions of 3-MA are best fresh-prepared by heating. Idelalisib (CAL-101, GS-1101) is a selective p110δ inhibitor with IC50 of 2.5 nM in cell-free assays; shown to have 40- to 300-fold greater selectivity for p110δ than p110α/β/γ, and 400- to 4000-fold more selectivity to p110δ than C2β, hVPS34, DNA-PK and mTOR. Wortmannin is the first described PI3K inhibitor with IC50 of 3 nM in a cell-free assay, with little selectivity within the PI3K family. Also blocks autophagosome formation and potently inhibits DNA-PK/ATM with IC50 of 16 nM and 150 nM in cell-free assays. Dactolisib (BEZ235, NVP-BEZ235) is a dual ATP-competitive PI3K and mTOR inhibitor for p110α/γ/δ/β and mTOR(p70S6K) with IC50 of 4 nM /5 nM /7 nM /75 nM /6 nM in cell-free assays, respectively. Inhibits ATR with IC50 of 21 nM in 3T3TopBP1-ER cell. Pictilisib (GDC-0941) is a potent inhibitor of PI3Kα/δ with IC50 of 3 nM in cell-free assays, with modest selectivity against p110β (11-fold) and p110γ (25-fold). Phase 2. Alpelisib (BYL719) is a potent and selective PI3Kα inhibitor with IC50 of 5 nM in a cell-free assay, and minimal effect on PI3Kβ/γ/δ. Phase 2.